A Makeup & Beauty Blog – Lipglossiping » Blog Archive Charlotte's Corner for Jo Malone at Selfridges. Charlotte’s Corner for Jo Malone at Selfridges. It’s arguably every girl’s dream to create their own space. From the day your parents let you pick the paint that will adorn your bedroom walls until the moment you sign the lease on your first flat, there’s something so utterly empowering about unleashing your personal style upon a visible arena. 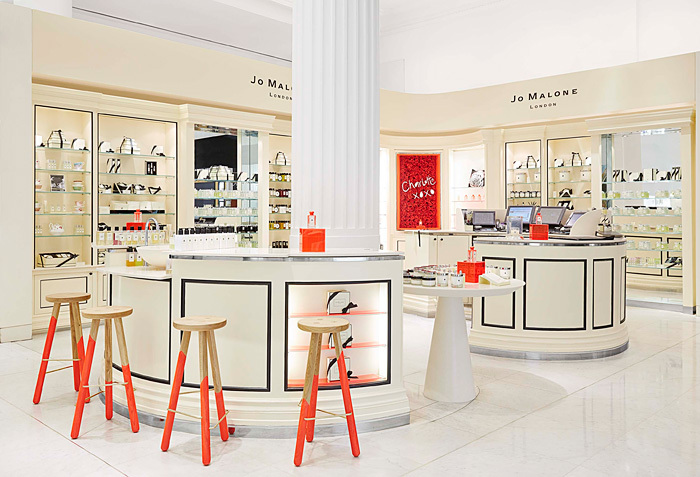 Well, Jo Malone London’s Style Editor Charlotte Stockdale must be doing cartwheels, because you can’t get much more visible than the beauty hall at Selfridges. In celebration of one of Jo Malone London’s most traditional scents, the brand are continuing to place their trust in super-stylist Charlotte, who has been revamping the brand’s classic image since her appointment as Style Editor last year. 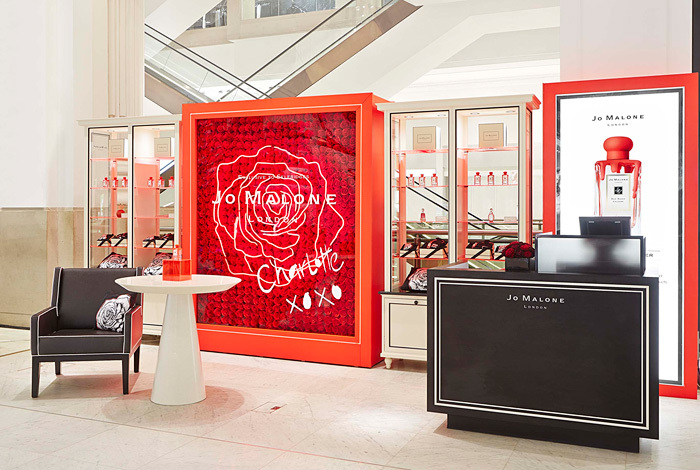 The star of the show and Charlotte’s favourite Jo Malone fragrance, Red Roses, has been transformed from mere perfume into a collectable objet d’art – three hundred limited edition cologne bottles have been hand-dipped in neon paint and individually numbered. Priced at £120-a-piece, demand has been high but perhaps a little more attainable for us mere mortals are the pretty textiles that have been created in collaboration with Abigail*ryan, the Belfast-based homeware company. There’s a great post on Abigail*Ryan’s blog detailing the manufacturing process of these very pretty pieces, the little scent sachets – all stacked up and ready to go look completely darling don’t they? 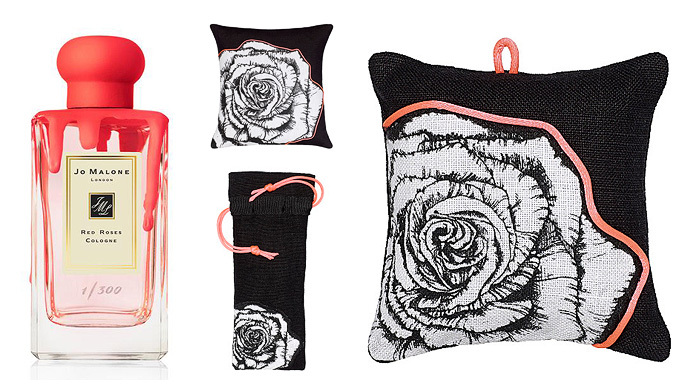 The Red Roses Scented Sachets are priced at £22, the Cologne Pouches are £20, and the Scatter Cushions are £90. Available to buy online from selfridges.com or on counter at Selfridges London and Manchester Exchange. Love this brand soooo much. Although quite pricey, it is worth the expense on it.Thanks!